Got Invitation of New ORKUT! 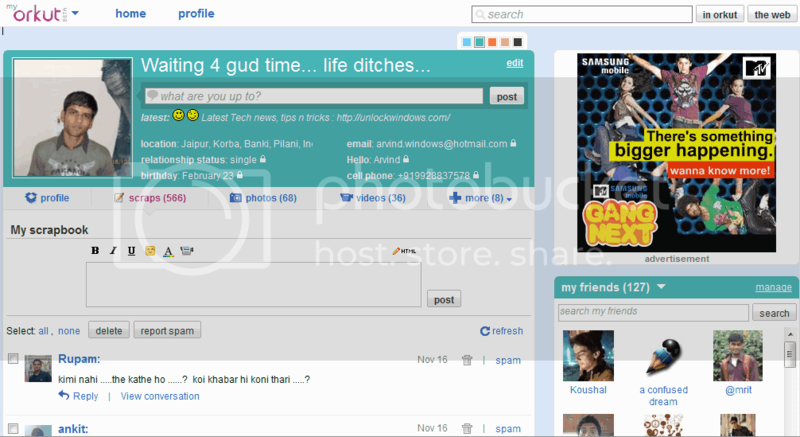 Now enjoying the new orkut !!! Fewer pages, faster browsing: We’ve concentrated orkut’s principal actions onto your homepage, making it a one-stop-shop for nearly everything that you’d like to do. Now you can chat, watch videos, and browse and search within your full friends and communities lists without ever having to open a new page. See a photo, video, or status message in your activity stream that you’d like to comment on? Just start typing away. After all, fewer pages and a GWT interface mean less time waiting for things to load and more time doing what really matters– hanging out with your friends! A clean, simple interface: We’ve reorganized the most important activites on orkut so that they are easy to find and even easier to use. Look out for larger pictures, easier to access notifications, targeted friend suggestions, and key updates closer to the top of your homepage. Now you can even use your friends’ profile pages to keep up with their most recent activities and leave them scraps. Greater personalization: Make your orkut profile and homepage truly your own by choosing the color that best fits your style. Have a personality that’s too unique to be captured by words? We’ve also made it possible for you to customize your “about me” section, adding video, OpenSocial applications and much more to your array of options. And much, much more: This is just a taste of all the new things you’ll find on orkut. Learn more about all of the different features you’ll find on the new interface by visiting this page on the orkut Help Center. Just wait for this new sensation of ORKUT !! !